This week I have Ian Johnstone as well as Elsa Ng and her family to thank for giving me the opportunity to do this event. Most of my training is done alone. Particularly my riding. The reason for this is partly because most of my friends prefer the roads to the trails and partly because I prefer it that way as it allows me to focus internally. However, it had started to occur to me that it would be a good idea to see how my mountain biking was coming along relative to others so, as a result, I thought I ought to do some pure MTB races. 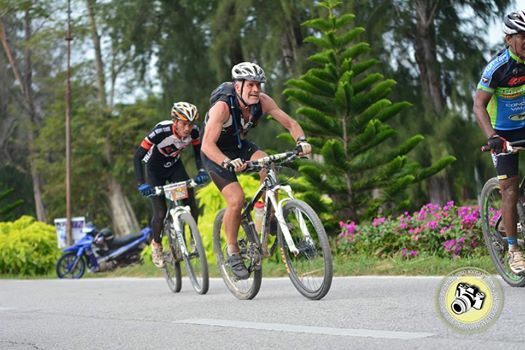 In the same moment, I realised that I was completely out of touch with the Mountain Bike event scene here in Malaysia. As, I think the last serious one that I did was the Burung Hantu Ride in Malacca almost 4 years ago! Fortunately for me Ian is well up on this vibrant community and race scene. As he's a regular at most races as well as being very competitive in his age group. After sharing with him my intentions, he kindly suggested this event and Elsa stepped up and did the necessary for me in terms of getting me on the start list given my inadequate Bahasa. Her Mum & Dad also very kindly allowed me to stay the night with them at their home in Langkap which as it happened is very near to a lovely little town on the banks of the river Perak called Teluk Intan. 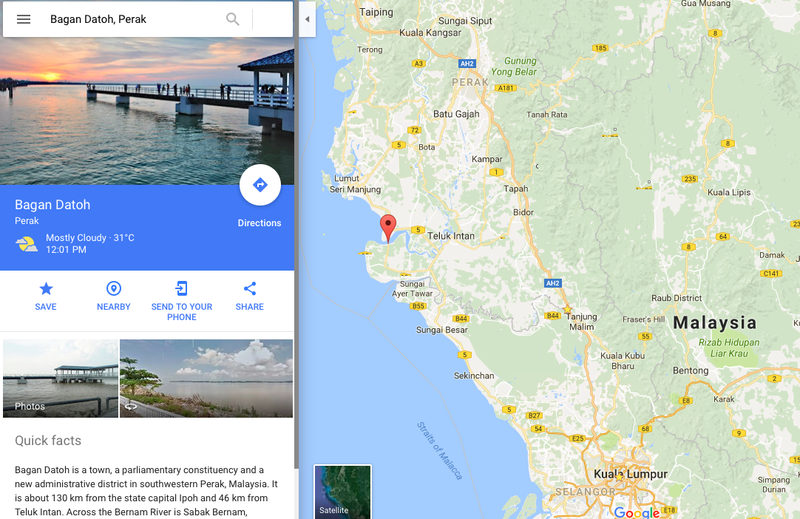 This made the journey there yesterday morning much less arduous as, for the uninitiated, Bagan Datok is rather remotely located at the mouth of this amazing Sungai (River) that winds it's way through Perak from the Kelantan/Thailand border from the Belum Forest Reserve. As a result, I arrived at the race venue with what seemed like plenty of time so that I could get a decent position somewhere near pole to help me not have to fight my way through a large crowd like I remember having to previously. This fact was confirmed by the huge car parking area being almost completely empty. After finding my way to the registration area where I was welcomed by a very friendly team who were equally efficient and were a credit to the race organisers, I trotted off to the start area to check my bike in with bib number duly attached to my bike. The prospect of a quick get away was very quickly dashed though when I discovered that approximately 500+ riders had beaten me to being anywhere near to a pole position as the starting pen was awash with what probably amounted to millions of Dollars worth of carbon 29'ers. This didn't unduly concern me as, after all, I was viewing this very much as a training ride rather than a race and had even packed my runners so I could get a solid 40 minute 'brick' run in after the 50km ride. So Scotty & I found a little space in the middle of this sea of carbon where we wouldn't look out of place. My race bike that I'm blessed to be riding at the moment (thanks to my XTERRA business partner Sean's generosity) is still in the ICU (that's short for Intensive Care unit rather than my dyslexic reference to the Union Cycliste International - The world governing body of cycling) after its adventures in Langkawi. As a result, as you can see from the shot below, I am back riding my old faithful Scott Scale which, like me, looked decidedly old against all these new shiny toys that these other boys and girls were riding. The first 2-3km was along the main road heading west towards the open ocean. During this time there was enough time for the faster riders stuck behind the 500+ bikes that were parked in the front of the pen to weave their way forward and get into the main group of riders. The intensity with which some of these people are able to accelerate to this really impressed me. Ian was one of these riders but there were a few others including some junior and female elites. For my part, I did the best I could to get as close to the front as my old diesel engine would allow. But the inability for me to sustain too high a heart rate limited the level and length of pedal power that I can deliver. As a result, my progress compared to others was steady rather than spectacular and by the time we turned off road I knew I wasn't going to make the leap across to catch the end of the leading peloton like Ian and others had done. That said, as the trail opened up along the side of the river and coastline I was pretty confident that I was now somewhere in the top 100 or so riders. Whilst this wasn't close enough to allow me to get on the wheels of the really quick groups ahead of me. I was pretty content with this situation given where I was a few kilometres ago and hoped that my sustainability and stamina would help me pick up places later on and, most importantly, not lose any. Despite now being off-road the pace of the peloton I was in was more like a road ride. I estimated that we were doing close to 30km per hour. However, Saiful who passed me at this point made us look rather ordinary as he and 1 or 2 others passed me as if I were standing still. He'd taken a little longer to pass me than Ian because, as I found out later, he'd been rear ended by someone in the mad dash down the road causing him to come off. This showed me the different level that I was at in terms of putting power through the pedals. As even though the terrain was pretty dry and compact I really could not imagine riding this off road terrain at a speed faster than this. Saiful and a few others that were capable of making the leap to the leading groups though made this look effortless though and all I can do is simply salute them. For my part I was happy to sustain the speed we were doing as I knew that any more wasn't going to be sustainable for me. So I settled into the pack and started to appreciate the sea air and the scenery that we were passing through all be it a rate of knots. I don't mind confessing that, in the process, I let some of the younger riders do most of the pulling, as it was all I could do still to stay on the wheels ahead of me. Surprisingly, the 1st of the 4 Check points came up on us before I had expected it to. However, given the speed we were travelling at it I shouldn't have been surprised at all :-). Wherever possible I try to be self sufficient at races and this was only 50km I was carrying enough water in my Camelbak and a bottle of my "home-brew" (Lemon, Honey & Chia Seeds) to cover my energy needs too. So, with no need to take on water, I headed straight for the team that were dispensing the checkpoint stickers. I'd expected these to be stuck on the race numbers mounted on our handlebars as they usually are. So I slowed to allow this to happen but as I approached the marshall he, rather unexpectedly, gave me a short sharp smack around the head as he stuck the sticker to my helmet :-) I have to being somewhat surprised and confused at this but, as you'll appreciate, I chose not to stop and enquire as to the reasons for this and was thankfully able to locate said sticker and carefully peel it off and stuck it onto the number plate where it should have been placed without losing it (the sticker) or the group of 8-9 riders that I was riding with. Quite bizarrely the same thing happened at the 2nd Checkpoint and the same urge came over me to stop and ask what they were playing at smacking it wasn't until we reached the 3rd Checkpoint that I realised that there was a method in this apparent "madness" of the premie and others on the head. Perhaps it was a weird local custom to this remote corner of Perak. As I approached the 3rd Checkpoint I was expecting the same procedure but to my surprise as I slowed for the Marshal I had picked out to get the sticker from, he did the unexpected and did what I was expecting the previous two to do e.g. went to stick the sticker on to the number plate mounted on the handlebars. As he did so I realised that the previous two Marshall's hard a method to what seemed like this madness, as immediately as the Marshall attempted to stick the sticker to the number plate it tore from the cable ties that were retaining it to my handlebars and fell to the floor. Obviously I could not leave the Checkpoint without this so I had to come to a complete stop, unclip and pick the bib number up. This only took a matter of seconds I guess but by the time I had done this my little peloton were now several hundred metres up the road and I set off in hot pursuit. Pleasingly after about a 2-3 minute of high intensive chasing I managed to pick up the tail of the pack and sat there for significantly longer than those 2-3 minutes to return my heart rate back to a survivable rate. More pleasingly was the fact that my state of mind which in the past would have been really negative about what had happened was nothing of the sort. In fact, it was very matter of fact and the thought of the negative impact this was potentially going to have on my race position did not event enter my head. Instead, it was simply thinking about getting back to the peloton and I have to confess to being most encouraged that despite being well over half way through the race I was actually able to put in a high speed solo chase to help me bridge back onto this peloton. This was a huge positive for me as to know that whilst I didn't have that "punching" power at the start to get myself closer to the lead riders. I was really encouraged to be able so far into the race have that sort of capability to "kick on" like that late on into a race. As it could help me recover a position, as I had to do in this situation, or, in another situation, it could help me create a situation that would put others under pressure and help me to break away and improve my position in the final 3rd of a race. Shortly after and with 90 minutes of race time having elapsed (which was what I estimated the leaders would finish in) we turned out of the Kampung roads and the hard packed trails onto the main road heading north back to downtown Bagan Datok. As I'd hoped to finish in under 100 minutes I started to think that we had less than 10 minutes to go. So, having recovered from my chasing down the pack and in the absence of anyone else taking on the pace, I chose to give it a shot at the front. My intention with this to make sure that no other fast finishing riders could catch and pass us. As I moved to the front I started to encourage others to do likewise so as none of us were caught and passed by any faster finishing riders. Up to this point the group had been unusually quiet for a group of riders and it seemed that this banter was much needed as this perked the group up which had been unusually quiet up to now. Through the twists and turns of the plantation a group of 4 riders had now got a bit of a break away going on me and the other 3 riders I was riding with. As I knew that there were no riders in my age group category either with me or in this group of 4 riders ahead of me I was not overly concerned by this and chose to just keep them in view. We then emerged onto some hard packed trail which led us through some plantation workers homes and with this I could see that the group ahead of us had about a 30 second lead on us. More importantly, they were chasing and catching another small group of riders in front of them and whilst I had no idea where I was in relation to my age group the prospect of finding another rider that was spurred me on to close the gap and catch this group too. Fortunately for me with a bit of encouragement the other 3 riders believed there was some logic for them to do likewise and so we set about working together again to do this. Unfortunately, the group in front were wise to this and kicked on too and sadly despite some hard work on the final section of tarmac we basically run out of road before we could catch them. The organisers in the absence of chip technology actually did a commendable job at the finish of organising us with good use of spotters and people to organise us in the correct order for our times to be recorded. I was awarded with a finish time of 1:46:52 (I had 1:46:54 on my watch so that was fair). This was a bit disappointing as it is quite a way off of the 100 minute goal I'd set myself. These show me finishing just 3:43 behind the winner from Thailand but Arghhhhh, only a mere 12 seconds behind the 4th placed rider in my category who was obviously in that group we were chasing. Still, in the bigger scheme of things, I was very content really with both the way in which I finished and where I finished. In terms of the way I finished I was pleased that when needed in the last 3rd of a 52km race I still have several "Tigers" in my tank to rematch, push on and almost catch other riders ahead of me and, whats more, still be comfortable heading immediately out to do a 40 minute brick run as per my proposed training plan. In terms of the actual position I finished in I was 5th out of 132 in my category and 85th out of almost 1,200 riders. My average speed was just shy of 30km per hour. All of which is more than acceptable given where Scotty and I were on the start line, that Scotty is a full 6 inches shorter than all the other bikes that finished ahead of me given his short stubby wheels and the fact that she is seriously overweight given her "Ally" frame versus the standard issue these days of a stiff lightweight carbon frame that others are blessed with. 1. 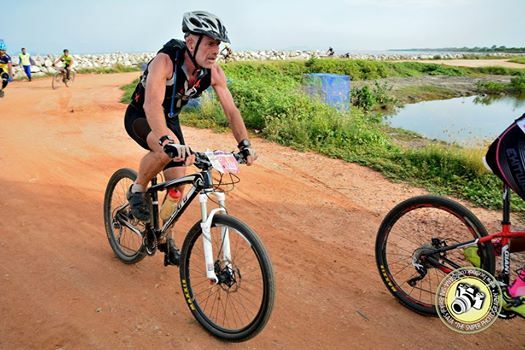 In a bike race with no run afterwards do not lose contact with riders in the final third of the race. 2. In a bike race with no run afterwards when feeling strong push on at every opportunity you can and engage and energise the group you are riding with to get them bought into this fact as well. Had we done this, who knows, we could have all ended up in better positions and I may have made up the 3 and a bit minutes needed to overtake the winner of my category. 3. Do more Mountain Bike Races as they are full of fun and friendly people and they really sharpen bike handling skills in every department.